Google is the largest search engine in the world today. And since it is the industry leader, it is only natural for it to set the standards. All bloggers and webmasters have only one concern in their minds regarding their sites when it comes to Google: whether Google is indexing their site or not? That is understandable, since most of their website traffic comes from Google. 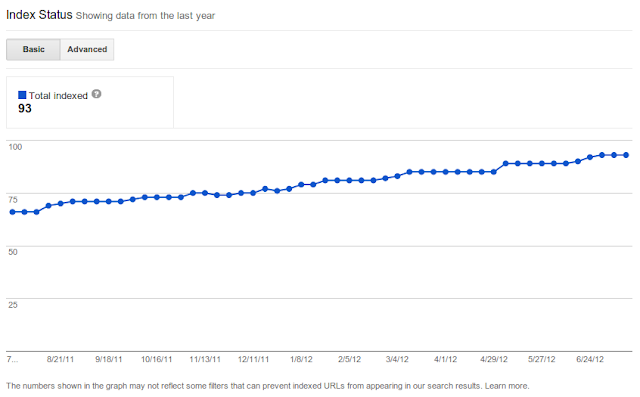 So to get un-indexed by Google is like having your legs chopped off - your blog won't be going anywhere, anytime soon. Well, to put some of the concerns regarding indexing at bay, Google has introduced a new Index Status feature in the Google Webmaster Tools. 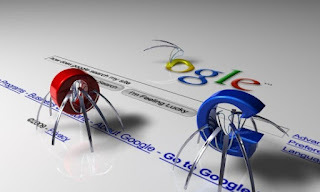 This feature will let webmasters know how many pages of theirs' have been indexed, crawled, and more! To check out this feature, log into your Google Webmaster Tools account. On the home page, click on the site for which you want to see the index report. Now click on the Health option on the left side of your dashboard, and select Index Status from the available options. Now, you will see two tabs, Basic and Advanced. The basic tab shows a graph which tells you how many pages of your site have been indexed over time. It shows up to one year of data. And then legend will tell you how many pages are currently being indexed. Google says this information is accurate, and does not include non-canonical URLs. So if there are more than one URLs pointing to the same content, or if there's duplicate content present, then it will be counted just one page instead of multiple pages. Google also admits that this data lags by around a week. So this isn't a real-time reporting. Rather, it is better suited for monitoring trends. If the graph has been steadily going up, then there's nothing to worry about. It means that your new content is being recognized by Google, and is being indexed. If the graph remains stationary, or falls down despite your addition of new content, then you might want to look into the Advanced tab. The Advanced tab gives more insights into how Google has been treating your website. 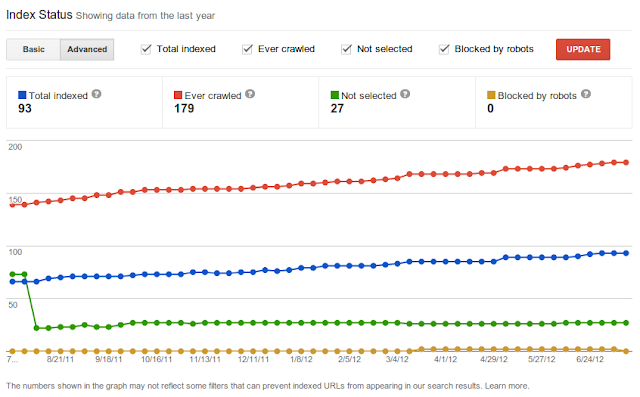 In addition to the Total Indexed graph, you can also see the Ever Crawled, Not Selected, and Blocked By Robots graphs. Ever Crawled - The total number of pages Google has ever come across on your site. This will show you your maximum total number of pages. So if you had 100 pages which Google crawled, and then you deleted half of them, this will still display a count of 100. It has a rel="canonical" tag to other pages. How this data is useful? This data could be really useful for debugging purposes to see what's wrong with your website and why you aren't getting traffic. An increase in the number of Total Indexed and Ever Crawled pages of course means that you site is on the right track, and that Google can easily access your content. However, if there is a sudden drop, then it means Google is having trouble reaching your website. It could be because your web server is down, or that, you added a sitewide "noindex" tag rather than adding it on just one page. A large number of Not Indexed means there are problems with canonicalization, or there's a lot of duplicate content on your website. You should make efforts to reduce the amount of duplicate content and non-canonical URLs on your website. The Google Webmaster Tools is your friend. It will notify you of any errors on your site, so you can easily correct them. It is helpful features like this that make Google the best search engine on the planet! But I would like you sir to concentrate on blogging tips. I think your tips are awesome. thank u so much. but how to resolve this problems ???? New post's on my blog are not displaying on SERP even after a week after publishing. That is used to be display with in seconds in older days. Whats the problem with my blog ? I've had my blog since April 2012 and so far I've written around 55 posts. I've submitted sitemaps for my blog, and according to Google webmaster tools it says that there have been 133 urls submitted and 132 indexed. I went to the index status you wrote about in this post in the "basic" tab, and it said there have been 0 total indexed. Then, I went to the "advanced" tab and it said that there have been 0 indexed, 3 ever crawled, 3 not selected, and 0 blocked by robots. Hey pal, nice post buddy. I saw this 2 days back but i was bit confused to understand these things. Not its cleared. in my account on basic tab "Total Index" is showing zero. why is this happen? MBT Please tell How to Fix Blocked Reboot URL? How To Get Money | Wanna Learn How To Get Money Fast? Read This Right Now! Increased the word limit of your posts to avoid panda penalty which just stike again. Also resubmit your sitemaps and ping google servers. If the sitemap page display that your pages has been indexed then you don't need to work because normally index status display deep reports for sites with larger bulk of URLs. You may resubmit your sitemap as precaution. Simply check the sitemap and click the resubmit button. 1.Always add an intro image and add post description. Very useful article, can you help me out with something related? Can you help me? Are my url blocked? My domain is only one month old/blogger, can that also be the reason? Thanks brother Mohammad! Some people like Aswath K. never show respect to anyone, just steal other people's valuable hard work and make it their own. Some Indians are very cunning. I am realy Sorry brother. Just complaint me. Dont complaint whole people. I am going to change the template with in a week. And Also I Place That COde You Give Me In Previous Comment/Reply, But The Thumbnails Of My Post Was Not Displayed...??? This Is My Blogger Blog Syed Bahadur Shah 4u Please Visit One Time And You Will be Seeing That Thumbnails Not Work Please Reply Brother I Am Waiting...!!! Thanks Qasim For Sharing Great Guide About This Health Feature. But It Shows 47 URLs Blocked By Robots. What I Do ?? Very Nice...It Is Very Informative Qasim...I Like MBT So Much..Everyday i chack my mail account for MBT's New Tips Tricks..Thank You very much for providing these great informations..
@james Thanks mohammed, i also want to create drop down menu on my bloge SoftwareDon i have try you widget but it is not working on my blog layout. I just read your article. I found this article very useful. Hope to read more from you in future also. Thanks Brother for Sharing this..
this will help me to Increase my SEO..
Bro resize the pics they are out of the layout! their is index problem in Google webmaster. Its always show 2,3 pages less index from submit urls pages in sitemap. before any redirection there is no problem in index and submit both are equals. But now it always show index pages less them submitted. Please help me it you have any solution.